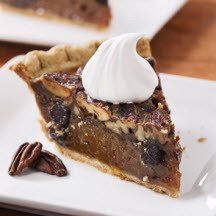 The flavors of mocha, chocolate and coffee, add a new dimension of taste to classic pecan pie. Preheat oven to 350°F (175°C). Place pie shell in pie plate on baking sheet. Beat eggs in medium bowl with a fork. Stir in honey, sugar, butter, dissolved coffee and vanilla extract. Stir in nuts. Sprinkle chocolate morsels over bottom of pie shell. Pour egg mixture over morsels. Bake for 60 minutes or until knife inserted halfway between center and outer edge comes out still slightly sticky. Serve at room temperature or refrigerate. Garnish with whipped cream before serving.